I wanted to like this book, I really did. 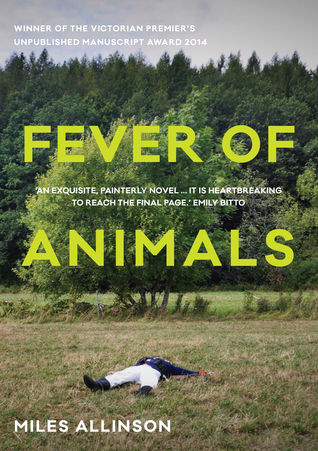 Fever of Animals won the 2014 Victorian Premier’s Unpublished Manuscript Award and I expected it to be rewarding reading. But alas, I didn’t take to it at all. It’s very clever, no doubt about that, playing with form and interrogating the act of writing both as process and product. It teases with the identity of the narrator who like the author is also called Miles and is an artist too. The book opens in doubt as to its own beginning – should it begin as the author/character Miles travels back to Australia because his father is dying? Or maybe with the death of his relationship with Alice? Or should it begin with his fruitless search to unravel the mystery of the disappearance of the surrealist painter Emil Bafdescu, which has been bothering him ever since he saw one of Bafdescu’s paintings in a restaurant in Melbourne? He can’t decide what to call the book that he’s writing either … nothing has quite worked out the way [he] planned. The blurb on the front cover describes the writing as ‘painterly’, alluding to a characteristic of artworks that have visible brushstrokes, the result of applying paint in a less than completely controlled manner, generally without closely following carefully drawn lines. (See Wikipedia). In art, painterliness tends to be impulsive rather than academic or skilfully detailed. But while the effect in Fever of Animals may appear to be uncontrolled, it is in fact a very skilful artifice. Some things about the book drove me crazy. Yes, I know this is trivial, but the constant references to being drunk and to smoking got on my nerves. I could almost smell that disgusting pong that lingers long after the smoker has gone away! Late in the book I came to understand that a 32 year old smoking has something to do with tempting fate and the narrator’s consciousness of death, which seems to underlie all his preoccupations. But (whether this was the author’s intention or not) it’s not what happens in Europe that interested me (that’s all inconclusive like everything else is) – it was the narrator’s interior thoughts as a visitor marooned in a land where he doesn’t speak the language. So many people think that they can visit anywhere in the world because everyone speaks English, but here we see that in Romania he is always alone because he can’t have a conversation with anyone. He is so pathetically glad when he meets up with an English-speaking art academic called Louisa because he can finally talk to someone! (She takes pity on him and helps him a bit, but she debunks all his half-baked theories and makes him painfully aware that he has no training or expertise in research. He’s not even smart enough to be a dilettante). … the first humans want to go back to the animal world, to before consciousness, yes? But how? They know they must trick the world with magic. So this is what they decide. They go into the caves, which are the most powerful places, and they paint the animals they know. Amazing paintings. Better than Picasso. She gestured at me. Better than the Surrealists, for sure. And amongst these animals they also paint humans. Not many, just a few here and there. And this is the important thing. She shook her finger in the air. The paintings of the humans always have animal faces. Because the humans are in disguise. You see? They have returned in disguise to the world of the animals, and they crawl as far as they can into the darkness, all the way to the end of the cave, to paint. This is the first religion, this is the first art. The first magic. The girl pointed at her own forehead. But apart from this, all his reflections are one way, there is no input from anyone else except for what he can make of body language. It makes him very observant, but also very insular and self-preoccupied. It’s hard to describe this book… It crossed my mind that it was a way of writing somewhat like Gerald Murnane’s conceptual literature, in the way that things swirl around and the narrator is refusing to engage with any of the expectations that a reader of fiction might have. The only way to read it is to surrender and read it on its own terms. But – although I feel as I’m letting this brave author down by saying so – it didn’t work for me. Sophia Barnes at the Sydney Review of Books was very impressed. James Tierney at Kill Your Darlings found himself left with an impressed bemusement. (But in an erudite way). Interesting to read your thoughts on this one, Lisa, because I picked it up at Hill of Content last weekend but couldn’t bring myself to buy it. The blurb on the back simply didn’t appeal and reading your review confirms that my instincts were probably right. It’s great to read an honest review, Lisa. Thanks, Glenice. It’s not easy sometimes, when I know that I’m out of step with critical opinion, or when I know that the author and the publishing team have put their heart and soul into it, but at the end of the day we readers invest time and money in a book and honest opinions help us to choose wisely. PS Are you coming to the anthology launch in November?